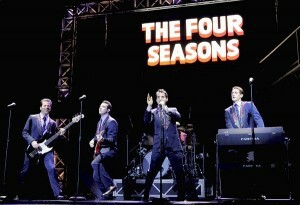 “Jersey Boys,” now electrifying audiences at Philadelphia’s Forrest Theatre, is an extraordinarily polished production. From its opening moments, this musical about 1960s crooner Frankie Valli and The Four Seasons dazzles and delights with its engaging, incredibly talented cast, its complex staging, its visual detail and its non-stop energy. Tony Award-winning director Des McAnuff and Tony Award-winning choregrapher Sergio Trujillo have put together a show that is full of rocking music, graceful dance steps, engrossing visual details, neon overhead lighting effects and heart. This musical bio is complex, full of drama, and oh yes, melodrama. Marshall Brickman’s and Rick Elice’s book not only tells the rags to riches rise to musical stardom of the Jersey Boys, but they have captured the uniqueness of Jersey. Brickman and Elice have an uncanny ear for the language, speech patterns and the far-too- many four letter words which punctuate their blue collar/Mafia-influenced conversation. And then there is the music — 27 classic hits, including “Sherry,” “Oh What a Night,” “Big Girls Don’t Cry,” “Walk Like a Man,” “Rag Doll” and “Can’t Take My Eyes Off You.” But what makes this music even more spectacular is the arrangements. Each song is first sung simply and then the arrangement is gussied up with show biz razzle dazzle until it becomes a fully orchestrated extravaganza. Jersey Boys playing in Philadelphia, PA through Dec. 12, in Forrest Theatre, 1114 Walnut St., Philadelphia. Get your Jersey Boys Forrest Theatre Tickets now and Meet Broadway’s Jersey Boys now in Philadelphia, PA at the Forrest Theatre.